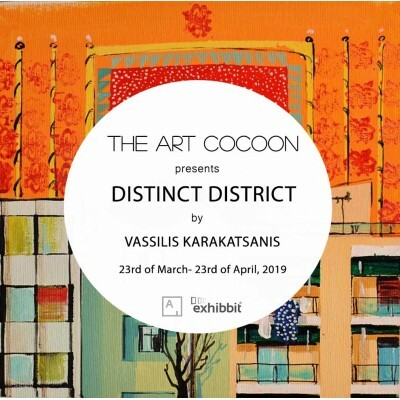 The Art Cocoon gallery presents contemporary artist, Vassilis Karakatsanis, at an online solo exhibition ‘Distinct District’. The current exhibition is a visual approach to the Athenian landscape through the artist's personal experiences. Each painting is a true story that has played out in the suffocating, concrete environment of districts in Athens and Piraeus. A personal journal with churches as bookmarks, identifying each region. These are ‘distinct’ points, which do not depict reality but rather sum up the artist’s feelings, and through this virtual reality, presumably the viewer’s too. Furniture, objects, insects and animals stand out against the urban grid, evoking our effort for an urban way of life – some times authentic, and some times not. There is asceticism and abstraction in the depiction of the urban landscape, and humorous symbolism, as the artist states his personal conclusions and acceptance of reality. An acceptance and affirmation that required a 36-year artistic journey in order to be processed and then expressed on the canvas. In most of his thematic units, he deciphers the urban landscape as an internal process, where the surrounding space is presented as a surprise, a theatrical action. Vassilis Karakatsanis (b.1957, Athens) studied painting at the Athens School of Fine Arts, art theory at the Barcelona School of Fine Arts, and conservation of architectural monuments at the Centro Europeo in Venice, with scholarships from the Greek State Scholarship Foundation, the Spanish Government and the Council of Europe. From 1982 to the present, he had more than 89 solo exhibitions, in Greece, Cyprus, Spain, Italy, Indonesia, Ecuador, Turkey, Denmark and Germany. He has taken part in many group exhibitions, art fairs and international exhibitions. His works are part of museums collections, as well as private and public collections in Greece and abroad. Available to view online in our 3D Gallery here.